Use the new Textjoin() function to reverse a string of characters suing a formulaic solution. Here is an interesting problem to start your day. Let’s say you work as DNA sequencing engineer at The Enterprise. And you just unlocked the sequence that is responsible for all male problems. The early onset of baldness. The sequence code is AAAA. 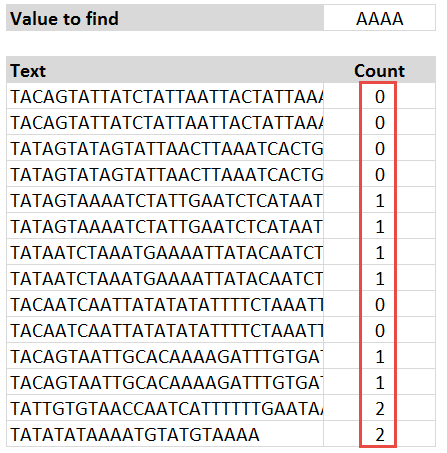 And you want to find out how many times this sequence is found in a sample of DNA strings, in the range B6:B19. Essentially you want the above. So how do you write the formula? On Friday (17th April – 2015), I flew from Vizag (my town) to Hyderabad so that I can catch a flight to San Francisco to attend a conference. As I had 10 hours of overlay between the flights in Hyderabad, I checked in to a lounge area so that I can watch some sports, eat food while pretending to do work on my laptop. There was a gentleman sitting in adjacent space doing some work in Excel. As I began to compose few emails, the gentleman in next sitting space asked me what I do for living. Our conversation went like this. Mind you, he had no idea that I work in Excel. We were 2 random guys in airport lounge watching sports and eating miserable food. He: You see, I am auditing this data. I need to locate all the blank rows and set them in different color so that my staff can fill up missing information. Right now, I am selecting one row at a time and filling the colors. Is there a one step solution to this problem? Needless to say, I showed him how to do it faster, which led to an interesting 3 hours at the lounge. 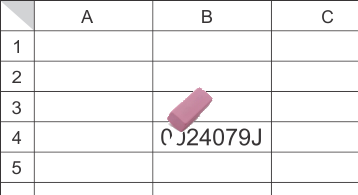 So today, let’s understand how to find & highlight all the blank cells in the data. Today we look at the third place winner from our inaugural Formula Challenge, a neat solution provided by Sajan. Palindrome: – A palindrome is a word, phrase, number, or other sequence of units that can be read the same way in either direction, with general allowances for adjustments to punctuation and word dividers (“Wikipedia”). This week in Formula Forensics we’re having a look at determining if a cell contains a palindrome. This is the second post of a new regular weekly series at Chanoo.org, Formula Forensics, where we will examine how a formula works from the inside out with a worked example to help you understand its formation. The other day, while I was putting my kids to sleep, this idea came to me. 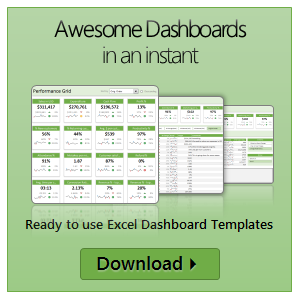 How do I check if a cell contains a palindrome, using Excel formulas? 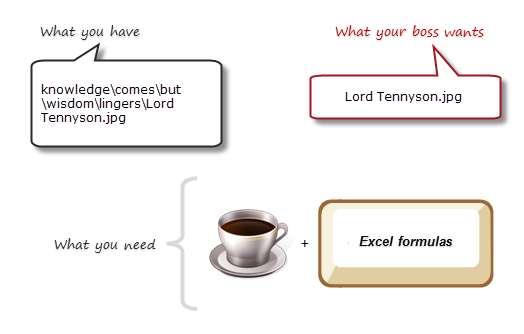 Next morning, I wrestled with excel for about 20 minutes and boom, the formula is ready. But what is a palindrome? 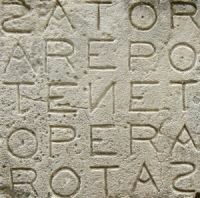 A palindrome is a word, phrase, verse, or sentence that reads the same backward or forward. For example: A man, a plan, a canal, Panama! So, to check if a cell contains palindrome, we need to reverse the cell contents and see if both original and reverse are the same. Here is a fun formula to write. 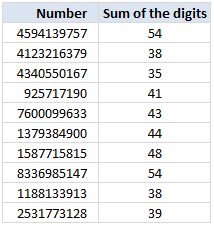 Given a number in cell, I want you to find the sum of digits in it. So, for eg. if you have the number 3584398594 in a cell, the sum would be =3+5+8+4+3+9+8+5+9+4, equal to 58. Now, how would you write a formula to find this sum automatically based on the number entered in the cell? Go ahead and figure it out. If you can, come back and check your answer with mine below. Jarad asks me in an email “how word frequency can be generated from a range of cells using excel formulas?” This got me thinking and lead to this post, where we learn how to calculate word frequency using array formulas and use it to analyze a bunch of search keywords.